BJP's prospective chief minister BS Yeddyurappa is contesting from Shikaripura, the constituency in Shivamogga, from where he won six elections. 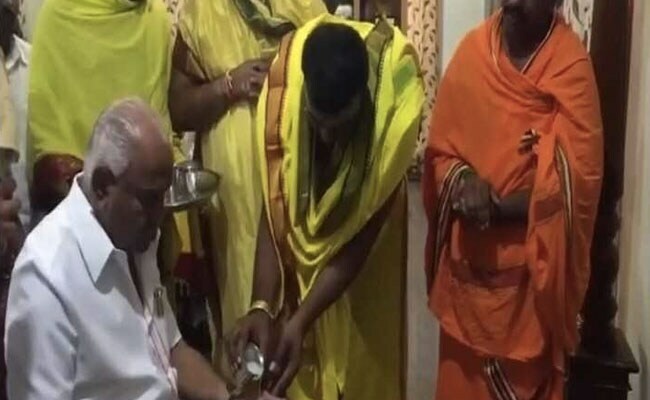 Karnataka Election 2018 Results: BS Yeddyurappa started his day with a temple visit. Bengaluru: BS Yeddyurappa, the BJP's prospective Chief Minister in Karnataka, has won from Shikaripura, the constituency in Shivamogga that awarded him six victories earlier. Leads show that his party, the BJP, will be the single largest party but will not cross the majority mark after going neck and neck with the Congress earlier in the morning. Mr Yedyurappa's closest opponent was GB Malatesh of the Congress - locally seen as weak candidate, since he is a Kuruba in this Lingayat-dominated seat. Mr Yeddyurappa, who also holds a parliamentary seat from Shivamogga, is one of the tallest Lingayat leaders in the state. Nearly 48 hours before the elections, Mr Yeddyurappa said his party will win 125 to 130 seats in the state - a prediction that flew in the face of the exit poll results that suggested a split verdict in the state. He had also rattled off a detailed itinerary for after the elections to reporters, which ended with a date for his oath ceremony. The show of confidence had drawn a jeer from the Congress, whose Chief Minister Siddaramaiah called it a sign of being "mentally disturbed". Mr Yeddyurappa had refused to be drawn out, commenting coolly that the Congress was about to lose the election and it does not matter what they say. Today, Mr Yeddyurappa started his day with a temple visit. In a rare move, the veteran state leader was projected as the BJP's face long before the elections -- a measure of the premium the party places on Mr Yeddyurappa in achieving a victory in Karnataka. Mr Yeddyurappa was instrumental in crafting a victory for the BJP in 2008, helping the northern giant establish its first government in the south. This time, he was called on to replicate that victory and given what's seen as a free hand in campaigning and candidate selection.